Thinkathon | Academics Camp at T.Nagar, Shenoy Nagar. Sisa's Play School ,28, Venkatachalapathy St, Shenoy Nagar, chennai - 600030. /Smart Kids, 23, Pinjala Subramanian Road, T Nagar, Chennai - 17. 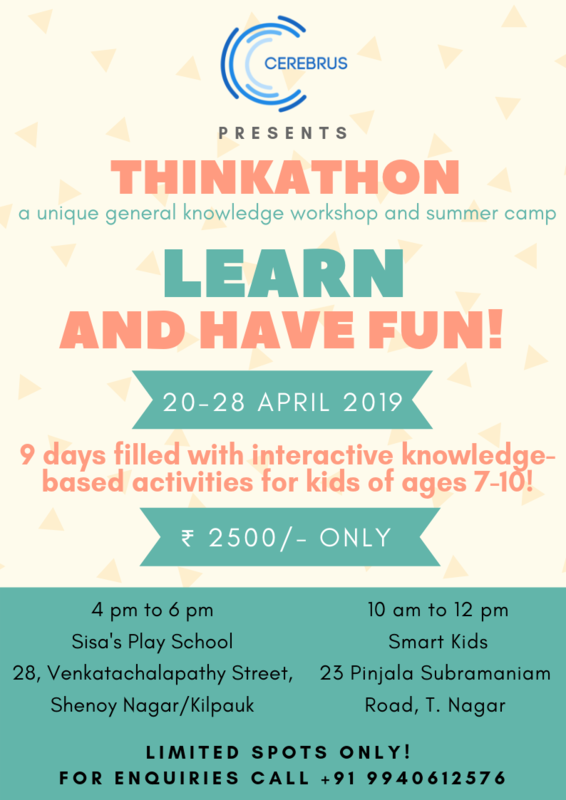 Thinkathon - the flagship general knowledge program for school children is now out in a brand new format - a summer camp! The summer camp will be a comprehensive workshop that will help spark an interest in general knowledge by exposing participants to a plethora of topics that goes beyond the usual academic learning curve in a fun, engrossing and an entertaining manner. The summer camp(s) will set as a prelude to the year-long programme that will kickstart from June 2019. Thinkathon has impacted over 350+ students over the last few years and is the brainchild of Cerebrus, a Chennai-based knowledge company with over 15 years of experience in the field of quizzing. 1. Venue: Sisa's Play School,28, Venkatachalapathy St, Shenoy Nagar, Chennai - 600030. Schedule: 20th April - 28th April (4 PM to 6 PM). Schedule: 20th April - 28th April.